Stenocarpus sinuatus (Firewheel tree) by Angela Lober, 2008. © The Royal Botanic Gardens and Domain Trust. 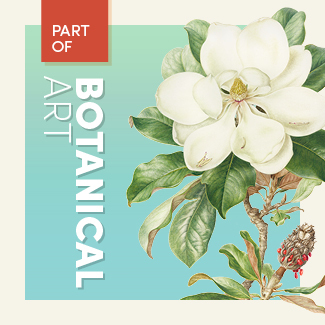 Finely detailed botanical artworks reveal the range of plants introduced to Sydney’s gardens over the past 200 years. The word ‘florilegium’, literally a gathering of flowers, was first used in 1590 to describe a publication that focused on the beauty of plants rather than their medicinal value. Florilegia flourished from the 17th century to the late 19th century, during which time they portrayed collections of rare and exotic plants. Modern florilegia record collections of plants from within a particular garden or place rather than new species from afar. In 2005 the Florilegium Society was formed to create a unique collection of contemporary botanical paintings of some of the most significant plants in the living collections of the Botanic Gardens & Centennial Parklands (the Gardens). Created over the past decade by 64 Australian and international artists, the 87 artworks are presented together for the first time in the exhibition Florilegium: Sydney’s Painted Garden, on now at the Museum of Sydney. The artworks depict familiar and rare Australian plants, as well as exotic species from Asia, the Americas, Africa, Europe and the Pacific region. They reveal how, since 1816, the private gardens, public parks and landscapes of NSW, including some of those managed by Sydney Living Museums, have been influenced by the plants grown by the Gardens. There has been a recent renaissance of botanical art, with many of the artists having turned to the form following careers in other fields. Others, who had careers as professional artists or designers, draw on their experience and combine it with the exacting skill of botanical art to great effect. Beverly Allen, founder and President of the society, previously worked as a freelance graphic artist and illustrator before becoming a botanical artist in the 1990s. Of depicting plants, she considers that, ‘to achieve true representation they are painted from life, their transience a challenge to the artist as well as an inspiration’. Following is a selection of the exquisite artworks displayed in Florilegium. This article was originally written for Unlocked magazine, the award-winning Members magazine for Sydney Living Museums. to achieve true representation they are painted from life, their transience a challenge to the artist as well as an inspiration. Botanists Allan Cunningham and James Bowie found Dichorisandra thyrsiflora when they were in Brazil from 1814 to 1816 as collectors for Kew Gardens. It was listed in William Macarthur’s Catalogue of plants cultivated at Camden Park, New South Wales, 1857. Blue ginger was planted in the Royal Botanic Garden Sydney in the late 1800s and grew in the dappled light of the shrubberies. In the 1980s the Vaucluse House pleasure garden was reconstructed in the 19th-century gardenesque style, with plants of Dichorisandra thyrsiflora sourced from the Garden. Beverly Allen paints in a scientifically accurate style with a superb analysis of colour and form that has broad appeal. In 2007 she was awarded a Gold Medal at the Royal Horticultural Society’s (RHS) London Botanical Art Show for her collection of eight paintings of Epiphyllum and related species. The bunya bunya is a majestic conifer, native to coastal ranges near Gympie in south-east Queensland (Bunya Mountains). It was named Araucaria bidwillii after botanist John Carne Bidwill, who supplied seed for propagation to William Macarthur in about 1842. It became a prized species and was planted in many botanic and municipal gardens and large gardens from the 1850s. Its presence in the landscape often signals an important 19th-century property, as seen at Elizabeth Farm. Dorothee Nijgh de Sampayo Garrido was born in the Netherlands, and now lives in Queensland. She had a distinguished career as a diplomat and as a judge in The Hague. Mostly self-taught, Dorothee also received tuition from renowned botanical artist Christabel King at Kew Gardens. Magnolia grandiflora, bull bay or southern magnolia, was probably introduced to NSW by William Macarthur of Camden Park, who gave Colonial Secretary Alexander Macleay a plant for his garden at Elizabeth Bay in 1836. With its large fragrant flowers and gorgeous glossy leaves, it is an iconic species found in very large gardens in Sydney. Jenny Phillips has worked as a botanical artist since 1971 and is Director of the Botanical Art School in Melbourne. She won the RHS Gold Medal in 1993 and the Celia Rosser Medal for Excellence in Botanic Art in Melbourne in 2008. Stenocarpus sinuatus, the firewheel tree, is native to northern NSW and southern Queensland. Botanists Allan Cunningham and Charles Fraser collected it in 1828, and an old tree in the Palm Grove at the Royal Botanic Garden Sydney likely dates from that period. It was increasingly admired during the 20th century. Rose Seidler loved the brilliant scarlet flowers set against the dark foliage and planted it in her garden at Rose Seidler House. Angela Lober is a landscape architect but her love of art and botany led her to study botanical illustration. She won a Silver-Gilt Medal at the RHS London Botanical Art Show in 2012 and the Celia Rosser Medal in 2014. VISIT Florilegium is on now at the Museum of Sydney until 30 October 2016. Botanic Gardens & Centennial Parklands comprises the Royal Botanic Garden Sydney, the Domain, Centennial Park, Moore Park, Queens Park, Blue Mountains Botanic Garden Mount Tomah and Australian Botanic Garden Mount Annan. The paintings have been gifted to the Botanic Gardens & Centennial Parklands in celebration of the bicentenary of the Royal Botanic Garden Sydney. From Beverly Allen’s introduction in Colleen Morris and Louisa Murray, The Florilegium, The Royal Botanic Gardens, Sydney, Celebrating 200 years, Sydney, The Florilegium Society at the Royal Botanic Gardens Sydney Inc., 2016, page 13. This exhibition celebrates the renaissance in the long tradition of botanic art and demonstrates the botanical and horticultural development of the Royal Botanic Gardens Sydney and its links with domestic gardens and the public landscapes of New South Wales over 200 years from 1816 to 2016. The passing of years has given many street photographs greater significance than may have been anticipated when they were taken. Behind each image lies a complex history that we can only partially discover. Browse a selection of images from the Ikon Studio collection. Autumn is the time when families like the Rouses of Rouse Hill House & Farm preserved the last of the warmer weather’s bounty to enjoy in the months to come. A team of specialists undertook a delicate and complicated operation to rescue a significant 1830s stone archway from an invasive climbing plant. The names and stories behind street photographs are often lost with the passing of time, and we were unable to identify many of the people whose images are featured in the Street Photography exhibition. However, we’ve since learnt the moving story behind one image, of two curly-haired children. A remarkable acquisition of 5000 street snaps provides a lively and revealing record of one Sydney street in 1950 and offers a rare glimpse through the street photographer’s lens. By the mid-1930s the street photography ‘craze’ saw increasing numbers of photographers on Sydney’s streets – all competing for the best locations and the most promising marks.